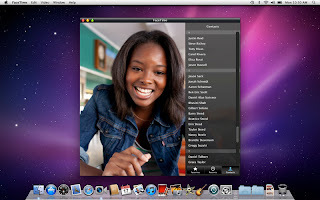 FaceTime makes it possible to talk with anyone on an iPad 2, iPhone 4, iPod touch, or Mac from your Mac. Setup is quick and easy, with just one click, you can make a video call to an iPhone 4, iPad 2, iPod touch, or another Mac. • FaceTime's widescreen aspect ratio makes it easy for families and groups to participate in a call.